I don’t know if I should tell you or not, but I kinda have a thing for Mexican food in my house. I’ve never actually thought about it until now, but I’m pretty sure I eat Mexican food at least once a week. 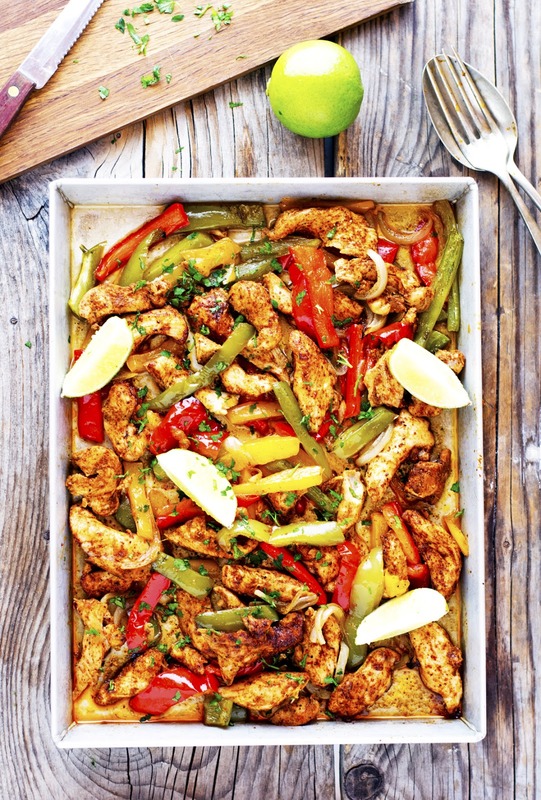 From quesadillas, to carnitas, to enchiladas, to these awesome Sheet Pan Spicy Chicken Fajitas. I do love making fajitas in the skillet, but lately I’m all for using sheet pans. My baking sheets for years have been overused for making brownies and cookies, but now I mostly use them to make amazing fajitas dinners. 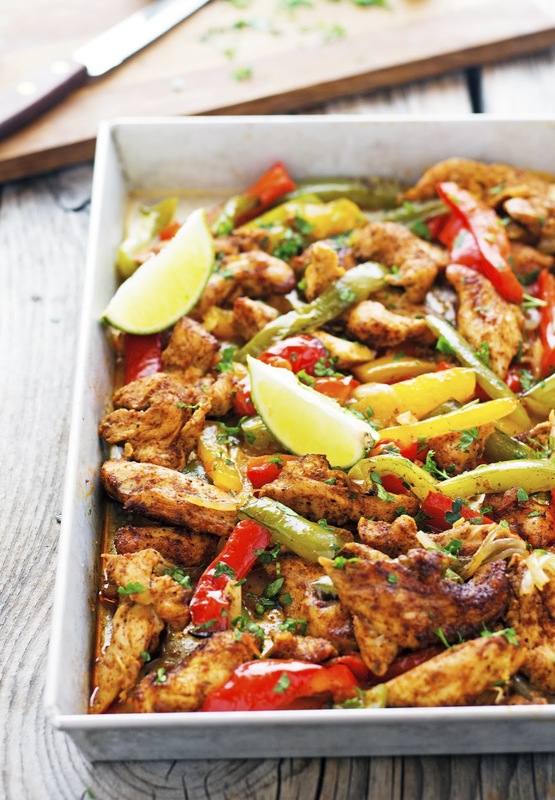 Chicken, bell peppers, and onions are tossed with oil and spices on a baking sheet then roasted in the oven until perfectly tasty and delicious. It doesn’t get simpler that than. This time around I’ve added a sliced poblano pepper. The poblano adds tons of flavor and a tiny bit of heat. You can definitely add more than one if you wish or use a green bell pepper instead. This is already a pretty quick recipe, but if you want something extra fast to cook on a weeking, do the prep the night before. It’ll keep for 24 hours in the fridge. Having your prep work already done should allow you to get dinner on the table in under 15 minutes with some Easy Spanish Rice on the side. Deliciously spicy, healthy, low carb, Paleo, and even Whole30 compliant. This recipe also feeds a crowd and works great for your lunchbox. So what are you waiting for? Go make some! 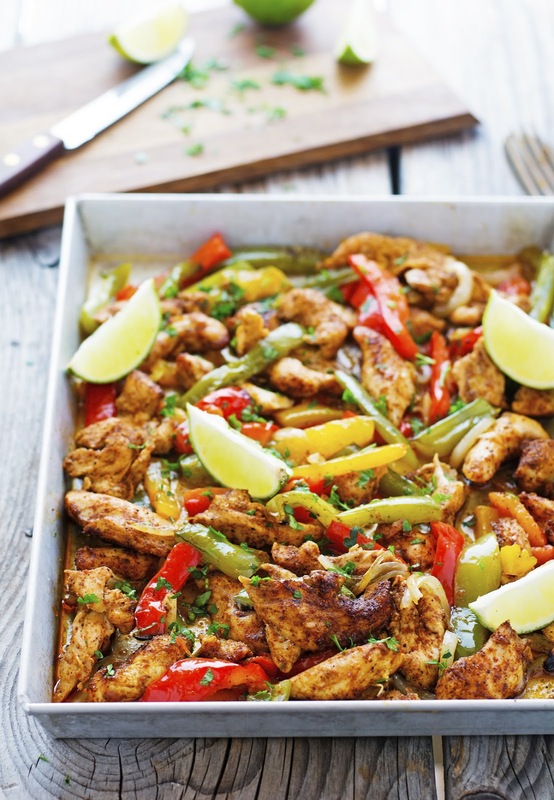 Sheet Pan Spicy Chicken Fajitas Print this recipe! *chili powders vary from country to country, I recommend using one that is fairly mild and increase if necessary. Preheat oven to 425°F (220°C) and place a rack in the middle. Lightly grease a large rimmed baking sheet and set aside. 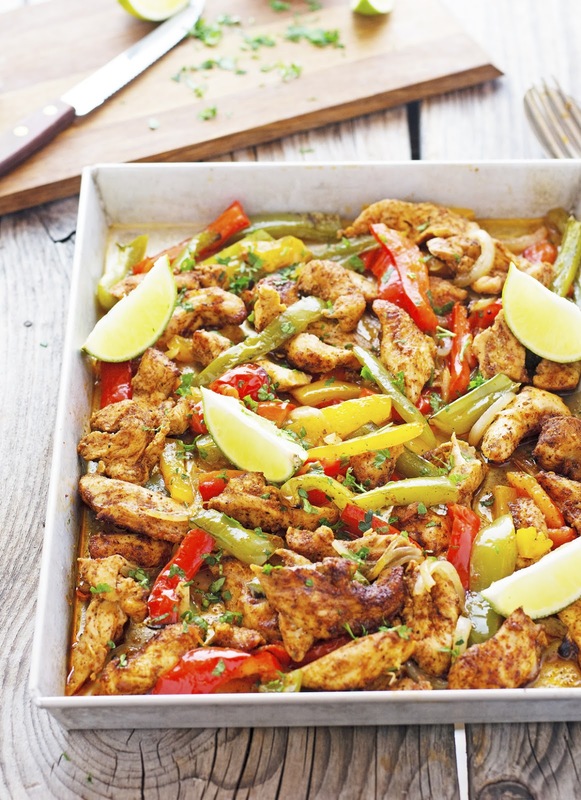 In a large bowl combine chicken, bell peppers, onion, oil, salt, pepper, chili powder, garlic powder, cumin, and paprika. Toss well to combine. Spread chicken and vegetables out on the baking sheet. Bake for 20 minutes, then turn on the broiler and cook for an additional 3 to 4 minutes, or until the peppers start to char. Remove from the oven, sprinkle with lime juice and with chopped cilantro (or parsley). Serve with warm tortillas (to make cauliflower tortillas use this recipe), rice or refried beans. One serving yields 308 calories, 15 grams of fat, 10 grams of carbs, and 37 grams of protein. Yum!This sounds amazing! Can't wait to try!